I am one of those people who could seriously leave the cake on a plate and just eat the frosting. Love it. Vanilla, chocolate, cream cheese or caramel, it is all good. Of late, however, I notice this annoying trend of wrapping everything in fondant so that it looks smooth and perfect. Frosting is not supposed to be perfect looking. It’s supposed to look like something you want to dig your finger through. Who isn’t jealous of the baby at his or her first birthday party completely engulfed in a buttercream glaze of frosting and cake bits? Beat the whites of an egg to an entire froth, and to each egg an 5 teaspoonfuls loaf sugar, gradually; beat a great while. Put it on when your cake is hot or cold, as is most convenient. A little lemon juice squeezed into the eggs and sugar, improves it. Spread it on with a knife, and smooth it over with a soft brush, like a shaving brush. Put sugar and water in saucepan, and site to prevent sugar from adhering to saucepan; heat gradually to boiling point, and boil without stirring until syrup will thread when dropped from tip of spoon or tines of silver fork. Pour syrup gradually on beaten white of egg, beating mixture constantly, and continue beating until right consistency to spread; then add flavoring and pour over cake, spreading evenly with back of spoon. Crease as soon as firm. If not beaten long enough, frosting will run; if beaten too long, it will not be smooth. Frosting beaten too long may be improved by adding a few drops of lemon juice or boiling water. This frosting is soft inside, and has a glossy surface. Well, in today’s world, the first one would appear to kill you with Salmonella or any other bacterial plague bought about and worsened by factory farming. The second one sounds kinda hard. Thread, soft ball, hard ball stages of melting and boiled sugar require more judgment than I care to employ for a cake frosting. The success of my kid’s birthday party can’t hinge on whether I boiled the sugar past the soft ball stage and into the hard ball stage. That’s too much pressure!!! The other frosting trend when I was small was to use the Wilton Buttercream Icing Recipe (frosting and icing are terms that are used rather interchangeably). You could decorate with it more easily, I suppose. Wilton also helped to user icing flower decorations to the masses. Rose covered cakes became all the rage. The Wilton recipe combines confectioner’s sugar, butter, vegetable shortening, vanilla extract and a touch of milk. The mouthfeel is what you would expect when one eats vegetable shortening. Sort of waxy and thick. Whenever you see cakes in the bakery with “buttercream” listed as the frosting and they are decorated with blindingly white icing, remember what butter looks like and just know it might have some butter in there, but will likely have shortening as well. I am generally anti-shortening because of the severe manufacturing process that turns a soybean and a cottonseed into a solid mass of fat-like substance. And the taste. Ick. Do you want a good looking frosting or a good tasting frosting? That’s the question. 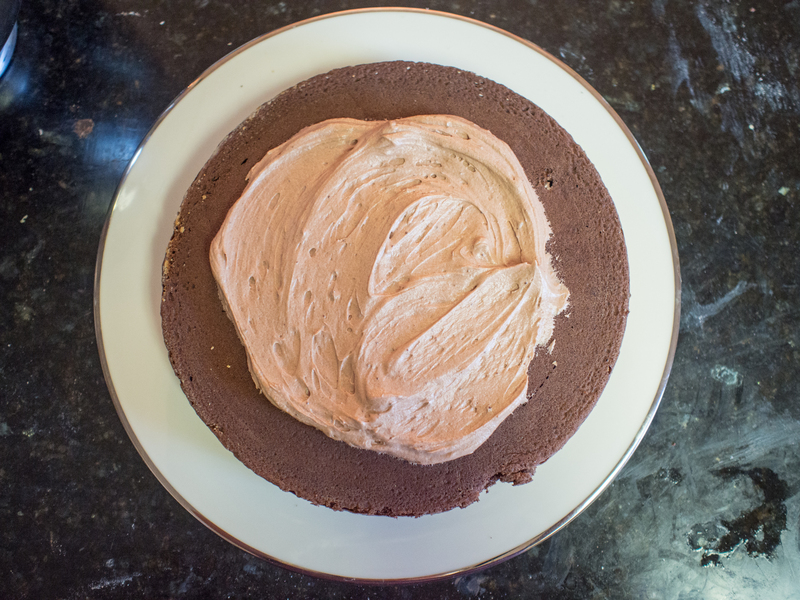 Sure, you can have a marble smooth covering on your cake that will look fantastic in pictures, but the taste? Eh. How much taste can you get out of sugar, glucose, vegetable shortening, gelatin, water and extract? I’ll say it: fondant isn’t good. It’s gummy and rather artificial tasting, as most fondants are manufactured and stored in plastic tubs indefinitely. You can also have a beautiful white frosting, but you’ll get stuck with something made from shortening. Or, you can go retro and have a frosting made with real butter. It won’t be blinding white and you can’t make flowers out of it. But, it will taste amazing. Like, you are hoping some makes it on the cake amazing. And frankly, it doesn’t really look “bad”. And, you can make it chocolate or vanilla flavored!! My inspiration from this recipe came from an episode of Good Eats and a book named The Cake Mix Doctor. I have every great cake book. Ruth Levy Beranbaum’s The Cake Bible? Check. Maida Heatter’s Book of Great Desserts and Cakes. Check and Check. Still, every cake I made was lacking. Then I saw Alton Brown recommend a box cake mix. Really?!? According to him, you can’t beat the chemistry in a box for great cake. With that logic, I found myself face to face with The Cake Mix Doctor book by Anne Byrn at a local bookseller and decided to try it for my son’s birthday. He wanted a cake that “bled”. So, I made the Red Velvet Cake. First of all, it was so easy because it was a mix. Second, he LOVED it. Now, usually when people go to a kid’s birthday party, I never see the adults take a piece of cake. I do the calculation myself and decide it’s not worth the calorie bomb to eat a piece of supermarket “buttercream” frosted cake and politely decline. The kids love anything “cake”, and that’s what is important. I don’t need it. At my son’s party, not a single piece of cake remained. It was gone. The adults ate it. No leftovers!! The secret? Probably not the “doctored” German Chocolate Cake mix with sour cream and red food dye (although that was good), but the rich cream cheese frosting. AMAZING. 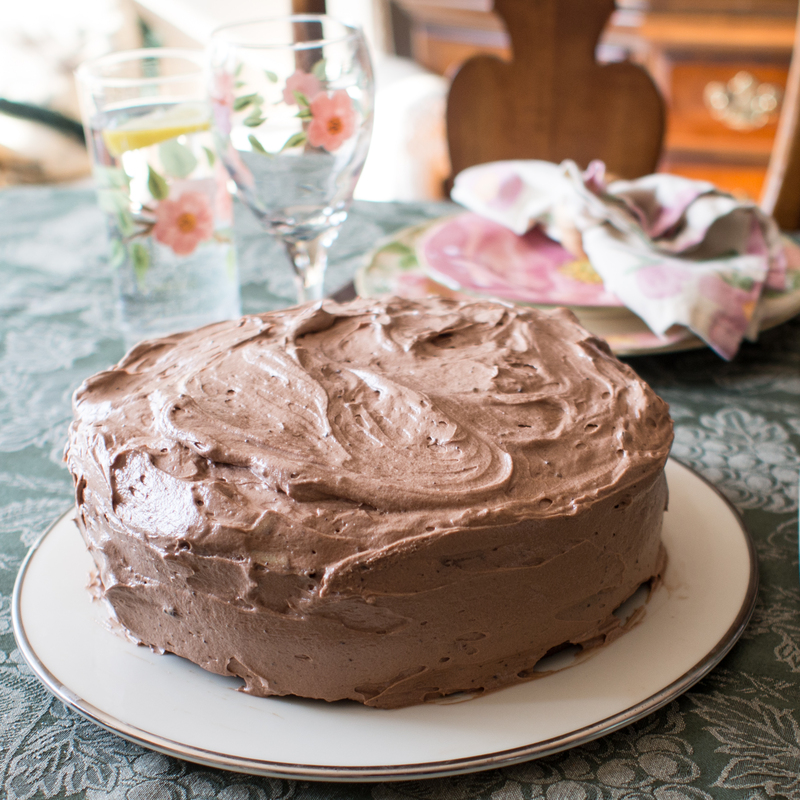 Anne Byrn recommends homemade frosting for her doctored cake mixes, and includes several in her book. She is right. No one thought I used a mix, and the frosting was great, but I have to doctor hers up a bit. Hers are overly sweet for me. My experiments are your gain. Also, making your own cake will cost a fraction of a bakery cake, and be just as good. 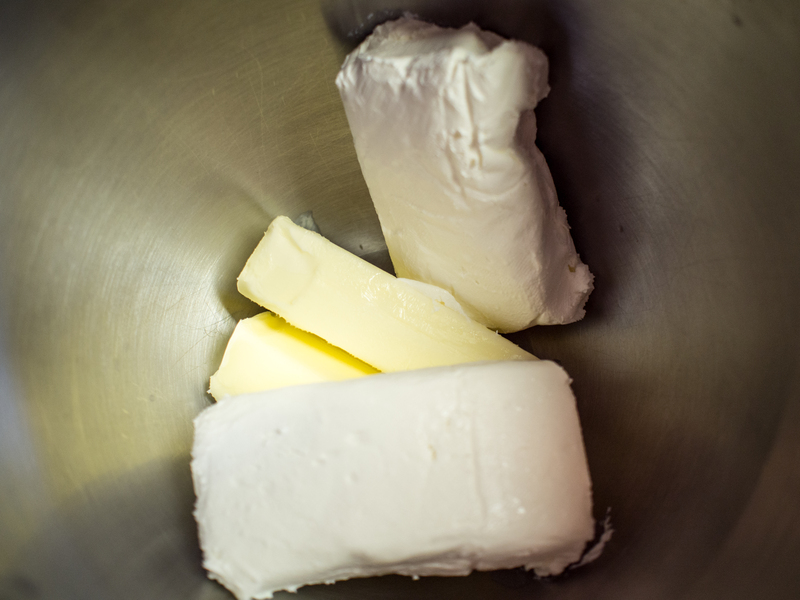 Cream together the cream cheese and butter in a large mixing bowl until well combined. Turn off the mixer. Add the cocoa powder, vanilla extract and confectioner’s sugar. Mix on low speed until the sugar and cocoa are mostly incorporated (this avoids the explosion of powdered ingredients). Increase to medium speed and beat the frosting until it is fluffy. I know, not hard, right? Not scary, no fear of failing. Just awesome, spoon lickin’ frosting. 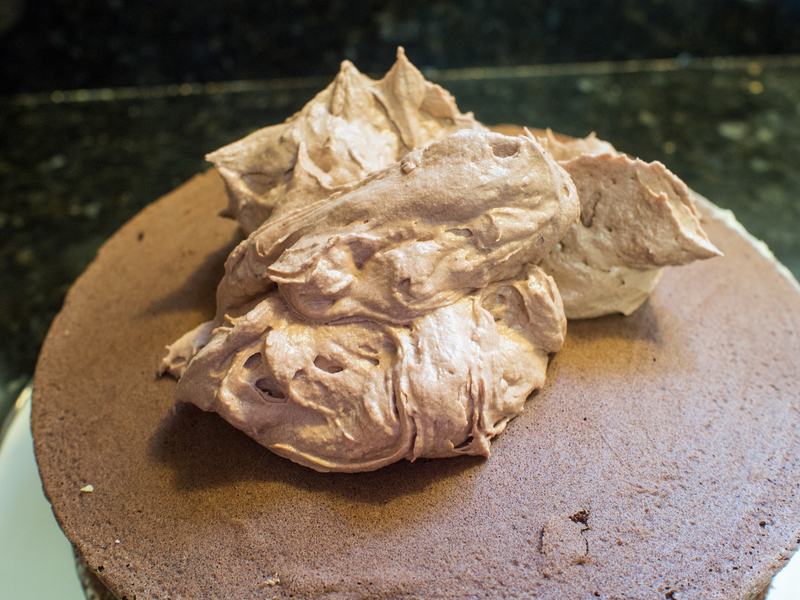 If you don’t want chocolate, omit the cocoa powder and cut the sugar to 3 1/2 cups and it’s an awesome white frosting. This entry was posted in Dessert and tagged Anne Byrn, Boston Cooking-School Cook Book, Buttercream, Cake, Cake Mix Doctor, Chocolate cake, chocolate frosting, frosting, Icing (food) on May 24, 2013 by dawn of food. What is the reason, one after you apply the frosting on the cake and put it on the fridge. 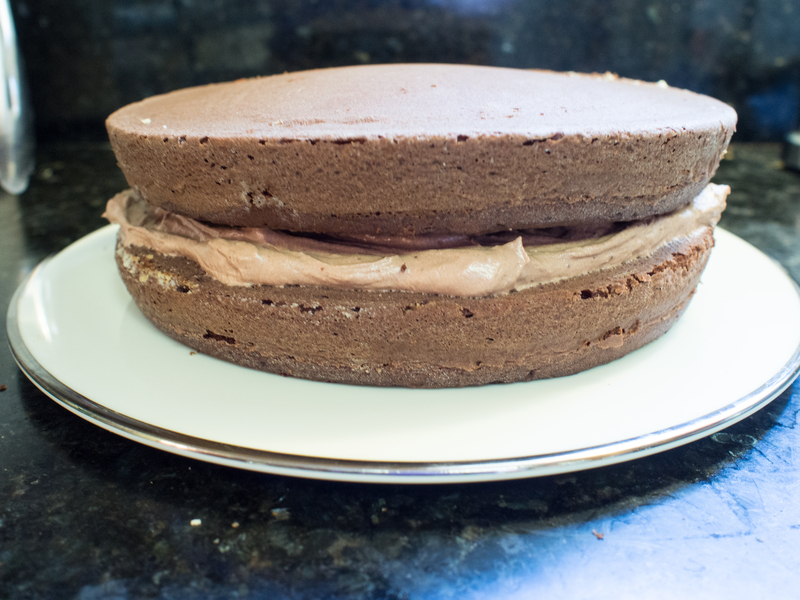 And after you eat the cake (with the frosting) You can feel a sandy texture from the frosting. I haven’t encountered this problem, sorry.